Frank Phillips spent last Wednesday staring down 600 boxes of election materials — voted ballots, blank ballots, precinct records — sitting in a warehouse run by Denton County. After sitting in storage for the legally required periods — up to nearly two years in some cases — the roughly 24,000 pounds of paper were finally ready to be shredded. Yet despite the hassle — and the significant cost — Phillips, Denton County’s elections administrator, is looking forward to this fall, when he will implement the county’s newest voting plan: a complete return to the paper ballot. The unusual move sets Denton, the ninth-largest county in Texas and one of the fastest-growing, apart from the state’s other biggest counties, which all use some form of electronic voting, according to data collected by the Secretary of State’s office. Both Bexar and Harris Counties, for example, have had all electronic voting systems in place for 15 years. Denton has been using a hybrid voting system that employs both electronic and paper ballots for about a decade. But county officials recently approved spending just shy of $9 million to buy new voting equipment from Austin-based Hart InterCivic that will return to an entirely paper-based system in time for this year's November elections. Even disabled voters, who will cast their votes on touch-screen machines, will have their ballots printed out and tallied through a print scanner. The move comes months after a disastrous election day for Denton County in November, with machines inadvertently set to “test mode” instead of “election mode,” long lines, problems with scanning paper ballots, and, ultimately, incorrect tabulations. Phillips — who was working in nearby Tarrant County at the time — said it was the personnel, not the machines, that caused chaos last fall. But voters in town, as well as leaders with the local Democratic and Republican parties, called for a return to paper ballots in the months following election day. And these aren’t just any paper ballots, Phillips emphasized. The new Hart system Denton purchased allows election administrators to print ballots on demand, eliminating the waste and cost of over-printing paper ballots in advance of an election and then having to expend resources storing those unused ballots afterward to comply with state regulations. It also prevents the problem of under-printing paper ballots — an issue that emerged last year when Titus County saw a higher-than-expected turnout for the presidential primary and officials were forced to create and hand-count ballots on election day. Denton County’s switch back to paper ballots is unusual in both the state and the country, though it’s difficult to identify any real trend, according to the Texas Secretary of State’s office. 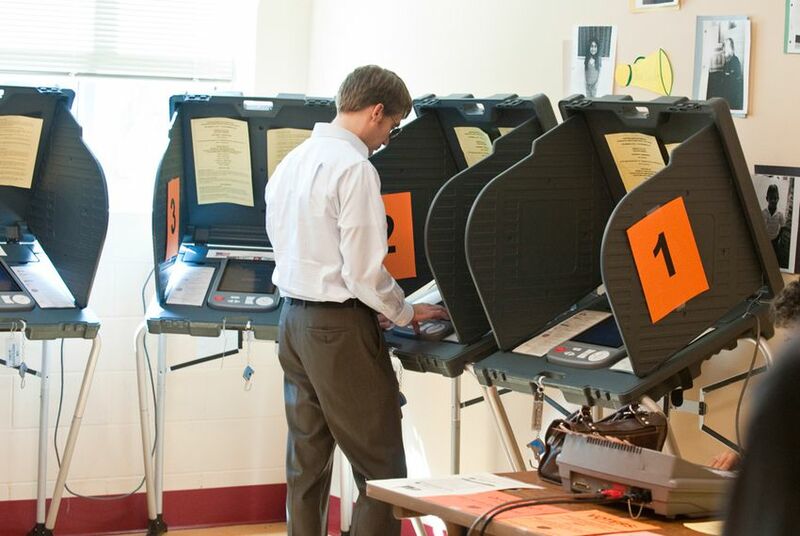 In recent years, an increasing number of counties have explored new voting technologies while purchasing equipment to replace outdated machines purchased years ago with federal funds allocated through the 2002 Help America Vote Act. Other counties have moved in the opposite direction, from hybrid voting systems to full digital ones. In Bexar County, for example, Elections Administrator Jacque Callanen said voters “absolutely love” the all-electronic system that has been in place since 2002. In counties like Bexar, paper balloting is only used for mail-in ballots. Still, paper isn’t entirely dead, even in Texas’s biggest counties. Bruce Sherbet, the elections administrator for Collin County — which currently uses all-electronic ballots — said as his office looks ahead to purchasing new voting equipment in the next year or two, it is “keeping all options open” and could return to a hybrid system. “There are some people that prefer a paper ballot, there’s no question about that,” Sherbet said.